Many people think that only cats purr. This is not true. There are a few other animals that purr just like a cat. Purring can be very healing regardless of what animal might be doing it. Personally, I love hearing my cat purr and it makes me feel really good when she does. I have only been able to hear other animals purr online. Just like cats, animals can purr when they are happy but they can also purr when they feel threatened or scared. Animals that roar do not purr such as tigers and loins and visa versa. The animals that purr do not roar. One interesting fact is that cats and other animals that purr will stop purring when they hear water running. The vets will turn on the water in order to try and get them to stop purring to hear their heartbeat and lungs. If you’re curious about what animals that purr like a cat then you might be in for a surprise. Bunnies can purr like a cat. One way they purr is that they show off when they are having fun by grinding their teeth. It’s very important to know the difference between when a bunny is having fun or in pain. 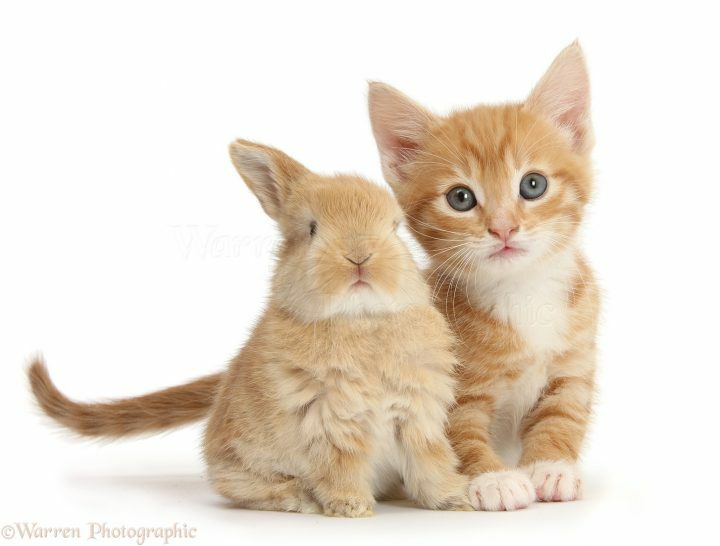 A bunny purring like a cat usually tends to be soft but when they are in pain, it can be very loud and often times more frequent. The reason why it’s more frequent is due to their contentment and you should take them to the vet if they are grinding in pain. Elephants can purr due to their low frequency rumbles that they use to try and communicate over distances that might be long. If you stand next to an elephant you might hear their strange vibrations. It’s very interesting that elephants purr and can make this sound since they are also known for their trumpeting. When an elephant purrs it tends to be more fancy then a larynx or other animals. Raccoons tend to be very intelligent and they are nocturnal. They can climb very well; swim when needed and extremely adaptable. They even know how to open the lids on trash cans in order to get food. Despite being intelligent they also can purr. The purring from a raccoon is also different compared to when a cat purrs. The purring sound is a lot more involved than the vibration that comes from a cat purring. You can feel the cats purring when you hold them against you but not so much with the raccoon. A purr from a raccoon is audible by exhaling only when cats purr continuous. When a gorilla purrs it’s big and loud. They purr when they are excited and very happy. Just like cats they can also purr when they are scared. The Gorilla Koko was known for also purring when she was happy. They don’t always purr when they are happy. However, when you hear a gorilla purring you’ll be amazed at how good it makes you feel because you know that usually for the most part, they are happy when they are purring. It’s a known fact that squirrels can purr especially if they are raised with cats. When a squirrel purrs it’s coming from the same vocalization from when cats purr but it’s not considered to be a true vocalization such as a hiss or meow. Their purring sounds very differently from a cat. It also doesn’t matter what color the squirrel might be because they can still purr regardless of their color. Squirrels also purr for wanting to have social interaction. Cheetah’s just happen to be like big cats. They even purr like smaller cats. When they are not purring, they can reach between the speeds of around 45-70 mph. They can be excellent swimmers but prefer not to swim. The cheetah is also not considered to be one of the great cats because of it not having a floating Hyoid bone in its neck and it’s because of this reason that the cheetah cannot roar. However, cheetah’s can be vicious and become territorial. They are also active during their day and their main source of activity is hunting. Their body was also designed for speed and it’s known to be one of the fast land mammals. Just because these animals purr like cats, doesn’t mean that they are friendly. Always be very cautious whenever you’re around strange animals and more so if they are in the wild. They might suddenly attack you without you even be prepared and hurt you. Sure, squirrels and other animals might not look frightening but if they don’t know then there’s still no telling exactly what they might can do. Always be on guard when you’re around strange animals.